In 2007, Tom and Kris welcomed Kara into their family when they adopted her from the Ukraine. 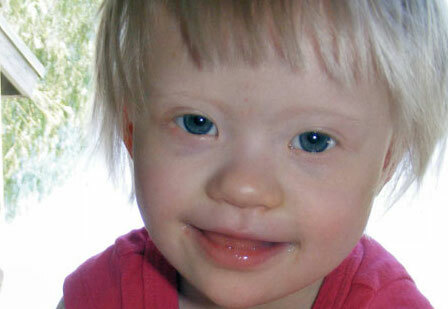 Kara and their youngest daughter, Meghan, also have Downs Syndrome. Knowing there are so many more children like Kara who are in need of the love and security of a family, Tom and Kris soon began a second adoption journey. Financing a second adoption so closely on the heels of the first proved to be difficult. Because time was of the essence, they turned to Gift of Adoption for assistance. A grant from Gift of Adoption provided the last bit of funding needed to give Amanda a forever family and allow her to be all she is meant to be. Your donations will enable a child to experience the love and sense of belonging that comes only from being part of a family. Using the donation form below, you can make a donation in honor of Thomas’ 1st birthday. We are grateful for your support! Let’s Change Children’s Lives Together!!! As far as I’m concerned, nothing is more important than family. This is why we chose to support Gift of Adoption for Thomas’ 1st birthday. Your donation in honor of Thomas will help vulnerable children become adopted into loving families. By making a donation here, you are about to make a very real, direct and permanent impact on the life a child. Gift of Adoption supports children by providing grants to help get them out of foster care or an orphanage and into the loving arms of a strictly screened, qualified parent – their forever family. Anything you donate on this page will be used to help the children who need it most be adopted to a family right here in MI. 140 million children worldwide are orphans – that’s equal to half of the US population. They are all under the age of 18. 10% of those children have been waiting to be adopted for over 3 years. For every month in an orphanage, a child can lose as much as 3 months of normal developmental advancement. Gift of Adoption is working to see that children are raised by families. And they pay special attention to assisting adoptions for the kids who need it most. Last year, about 15% of Gift of Adoption grants helped keep biological siblings together in one caring and loving home. 36% of Gift of Adoption grants went to children with critical medical conditions, giving them a chance to be adopted and receive the care they need. Your donation is tax-deductible and 100% of your donation will be applied directly to adoption grants.